Throughout his travels, David Anthony, The Creepy Bard, has learned many great songs and ballads, from songs of gallantry meant to stir men to great deeds, to songs rife with metaphor and innuendo meant to make the ladies blush. 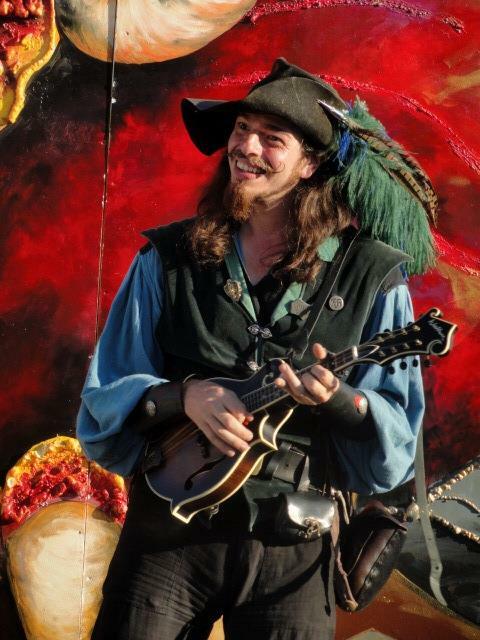 Whether at a royal court or at a common pub, The Creepy Bard can entertain men, delight children, and charm the lassies right out of their corsets. While The Creepy Bard can easily hold an audience single handed, he also plays well with others. Over the past four years he has played with The Rascals and Rogues, Three Pints Shy, and The Trouveres. He also also works frequently with Captain Tactless. Even when The Creepy Bard is by himself, he is never alone. A number of other people inhabit his head including Uncle Silas, Dovid Mordachai, and Seaman William Morningwood. These unusual fellows, as well as others, will often frequent his YouTube channel and occasionally get drunk and embarrass themselves at parties. And remember lassies, I’m a musician. I can use both my hands and my mouth at the same time in a coordinated fashion, whilst another body part keeps tempo.